For a person, slamming your head full force into a tree trunk could be enough to knock you out. Woodpeckers do this many thousands of times during their lives, and these birds have thrived on Earth for some 25 million years. But new research shows for the first time that all this pecking seems to carry consequences for the woodpecker's brain. Scientists found build-ups of a protein called tau in woodpeckers' brains that in people is associated with brain damage from neurodegenerative diseases and head trauma. The researchers examined brain tissue from Downy Woodpeckers and Red-winged Blackbirds (a non-pecking bird), from collections at the Field Museum in Chicago and the Harvard Museum of Natural History. The woodpeckers had tau build-up. The blackbirds did not. "It was assumed that woodpeckers have no brain injury", said George Farah, who worked on the study published in the journal PLOS ONE. "This research seems to suggest the contrary." The scientists are now trying to determine whether the woodpecker tau build-up is indicative of brain damage or somehow protective instead. "I coach football, let my son play football and play football myself", said Boston University School of Medicine neuropathologist Peter Cummings. "One day in the lab I was talking to another professor about how we've designed different types of sports safety equipment, like football helmets, based on the biomechanics of the woodpecker, but no one had ever looked at a woodpecker brain". 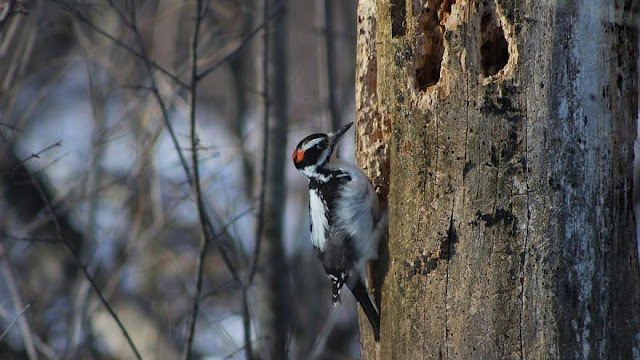 Woodpeckers have several adaptations to mitigate the impact of pecking, involving their beak, skull, tongue and the space between their brain and skull. They face substantial g-force (the effect of acceleration on the body) from pecking for food like insects and tree sap, or to attract mates. Pecking causes a force of up to 1,400g. A person can get a concussion from 60 to 100g. Tau helps to stabilize brain nerve cells, or neurons. If a neuron is damaged, a form of tau can build up, sometimes altering brain function. Cummings said there are many types of tau and some may be neuroprotective. "If indeed pecking is leading to increased tau accumulation, our study can't tell the difference between tau that might be protective or pathological," Cummings said. "However, you can hypothesize that because the birds have been in existence for millions of years and are thriving, that trauma-related neurodegenerative disease might not be an issue." 1 Response to "Health News: Woodpeckers show signs of brain damage"